Predictably nervous about his first date (or pseudo group date as far as the middle school equivalent goes) to take a girl he likes to The Flintstones, Tommy’s challenge wouldn’t normally be a big deal in avoiding embarrassment… that is if his father wasn’t Pulitzer Prize-winning humorist Dave Barry (played in the show by Night Court’s Harry Anderson). Telling Dave Barry not to be funny is like telling Meryl Streep not to give a good performance — even in the unspeakably horrid Mamma Mia!, the girl simply can’t help it and neither can the boy or at least the man-child personified in executive producer Jonathan Axelrod and Fred Barron’s adaptation of Barry’s beloved books Dave Barry’s Greatest Hits and Dave Barry Turns 40. As a childhood fan who religiously read each and every Dave Barry book I could get my hands on until - with the invention of the Internet - I was able to better track them down on The Miami Herald website, Dave’s World as a series was one I especially enjoyed when I was young. Seeing it again however — now in this slim-packaged three-disc set from CBS DVD and Paramount Home Entertainment — I realize just how much the show has aged and how the typically uninspired sitcom plots like “throw a bad party” (a la Mary Tyler Moore), or “quick, the kid’s pet died, let’s get a replacement one” or “the wacky sister-in-law is the houseguest that never leaves” had in actuality very little to do with Dave Barry’s column in real life. Yes, he wrote jokes about scatological topics and plenty of beer throughout and the books are filled with some suitably juvenile entries, but Dave’s World took some of the best written comedy fodder of the last decade and sadly turned it into a pleasant if forgettable concoction that makes it in retrospect seem like TV’s equivalent of tofu (in that it tastes like nothing but the rubbery texture just doesn’t quite sit right). This isn’t to say the show doesn’t have its moments and ironically the predictable plots I cited actually do provide fodder for some of season two’s best episodes, most notably in the dinner party where dates are dumped, wine goes bad, chicken cooks forever and everyone is out of the house by 8:25 or when the French exchange student mistakes the Barry’s adorable youngest son's (Andrew Ducote) pet rabbit for dinner which makes Dave’s wife Beth (DeLane Matthews) reveal her Hannibal Lecter side when she can’t stop eating it anyway. Much like other series, the supporting cast that revolves around the titular character is the reason to watch as Matthews in particular reminds me of an earlier version of Cheryl Hines on Curb Your Enthusiasm. Dave’s two best college buddies Kenny and Shel (Shadoe Stevens and Meshach Taylor) provide some great Odd Couple humor as the toxic bachelor and sensitive divorcee respectively, and the incessantly cheerful demeanor of his wacky assistant Mia (J.C. Wendel) brightens up every scene she’s in and doubly when her boyfriend Eric (Seinfeld’s Patrick Warburton) is in tow. Of course, between all of the typical obstacles of suburban life and the many issues facing his circle of family and friends, Dave somehow cranks out that famous column but, despite the charm of Harry Anderson, he never quite makes it believable, thanks largely in part due to the writing team’s decision to draw less from Barry’s column and more from the then current trends of safe family sitcoms. While it has some amusing moments there's not quite enough to fill all twenty-five episodes that are divided into three discs. Likewise, perhaps another reason it was unable to capture that same childhood magic it held when I was young (despite now our ability to predict nearly every joke uttered by Beth, Shel, or Kenny once you pick up the rhythm) is that the digital transfer quality is unspeakably poor, even on an upconverting Blu-ray player as characters appeared slightly blurred and shadowy despite adjusting the color scheme. Additionally, it’s also missing the show’s memorable “You May Be Right” Billy Joel cover by the band Southside Johnny which was used as the theme opener in lieu of this DVD set's replacement of a standard instrumental track until later in the season’s episodes, it’s abandoned altogether in an odd decision that calls attention to itself due to lack of consistency. 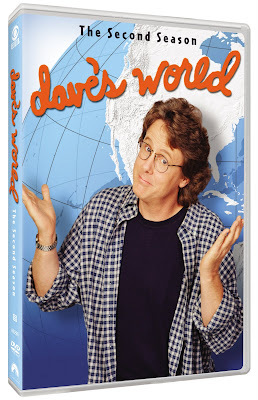 And although overall, while I still feel that Mia deserved her own series (although perhaps so did ABC as she would’ve been at home on that network’s Dharma and Greg), ultimately I can’t recommend this DVD set and instead encourage you to read about "Dave's world" instead of watch this watered down version of the wit of the real Mr. Barry.